Micromax Funbook is a series of the tabs at lower prices but with decent hardware specs specially treated as eBook reader by most of the users (as it does not emphasize on the good camera specification and also does not provide power hardware parameters similar to that of Canvas HD). With the Micromax Funbook Talk P350 they released the 7-inches tablet with the calling feature and with the SVGA camera at the back and VGA camera in the front. 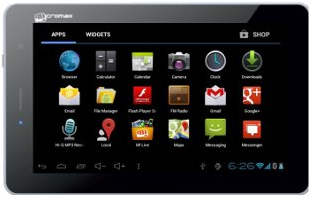 Recently they have released the successor to this tablet series named as Funbook Talk P360. In comparison to the 2800mAh of battery strength available in Micromax Funbook Talk P350 this time Funbook P360 is accompanied by 3000mAh (a slight increment in the strength) but with the help of 1GB Ram this time in P360 stand-by time (224 hours) and talk-time (4 hours) increase considerably because initially P350 had 512 MB RAM. The processor used this time in P360 has its cores clocked at the same frequency of 1GHz and as of now there is no information about the make of the processor. The primary camera used this time is better with the 2MP but the secondary camera is still the same. Brand: any brand, Color: Black and Pink, Screen: Led 7inch-10inch, Camera: Rear 3.2mp+ front 2mp, Resolutio: 600*2500 pixel, SIM Call: yes sim slot voice calling, Conetivity: A-GPS+Bluetooth+ Hdmi port+usb port+ keyboard port, Memory: 1GB RAM+ 8GB to 16GB Internal storage ROM, Battery: 4000mha to 8000 mha, OS: Android 4.2.2(jelly been), Processor: 1.2-2.2 GHz, etc. Rs. 4250 – 5550.